With a pitch in reasonable good conditions and at more normal altitude, Universitario de Sucre proved being nothing close to a menace. 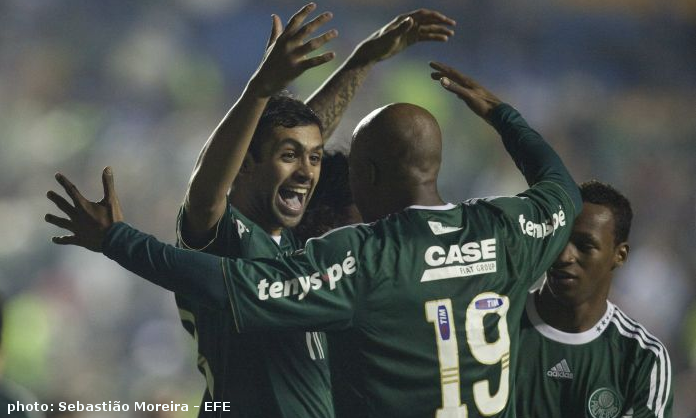 Palmeiras naturally and even with ease launched wave after wave of attacks, drawing ever closer to the opponent’s goal. After two very similar and perfect crosses by Gabriel Silva – on the first occasion finding Kleber’s forehead and on the second, Luan’s – with less than 30 minutes the scoreboard already showed 2-0. The first half offered up a single big surprise, and a pleasing one, one should add: Valdivia on the pitch and apparently fully recovered. Clearly Scolari opted for not revealing the Chilean’s real condition, as most of us doubted Valdivia would even be participating in this Sunday’s derby against Corinthians. On to the second half, which had not more than started when the stadium lights went off. The break lasted for roughly 30 minutes, while players kept warm and goofed around in apparent tranquillity. When the power was restored, Palmeiras maintained superiority. Highlights included Kleber having a finger pulled back into position by the medic team, a goal by Universitario – for a couple of moments rendering the game a bit more nerve – and a cross by Marcos Assunção meeting Danilo’s forehead, effectively killing any of Universitario’s growing aspirations. Watch the highlights below. Palmeiras’ opponent in the quarter-finals is Atlético-MG, who got the best out of the two games against Colombian team Santa Fé. Also Goiás did well against Peñarol in Montevideo and went through to face either Brazilian Avaí or their opponent Emelec from Equador, who tonight play the decisive game. The fourth quarter-final sports LDU Quito (Ecuador) against Newell’s Old Boys (Argentina). Next thank you / obrigado !!! Tati, thanks for your kind words. Please come back often and read the latest news on Palmeiras! Abraço! This is a awsome site and a excellent idea !! A lot of news about Palmeiras. I’m german, but I live most of the time in Belo Horizonte. Maybe, we could translate this blog for my language too ! Thanks for your message and interestinng remarks. A german in Belo Horizonte, Palmeirense… The world indeed take funny turns. Hope to talk to you more; either here, on twitter or by e-mail. Abraço! Parabens ao seu blog e sua dedicação levando o Nome Palmeiras para outros paises! Ian, obrigado pelo recado e o incentivo! Abraço! GREAT! Keep spreading Palmeiras’s love through the World! Your blog is great! Congratulations on your initiative. The Palmeiras fans now have a new site to visit often! Thanks ;)! Seremos campeões, mais uma vez!! Maravilhosa sua idéia!!! Parabéns pela iniciativa. Congratulations man. Nice job. Tadeu from Brazil, São Paulo. Hello! I’m a brazilian palmeirense (Palmeiras fan), living now in Japan. I always read the news about Verdão in the web, and there was a comment about this blog in one of the websites I always acess. I’m very happy to see your passion for Palmeiras. It’s been difficult for Palmeiras to be champion these last years, but all palmeirenses have always the hope that our team is going to play a wonderful soccer. The objective of every palmeirense is not only to see our team becaming champion. But the art of soccer is our biggest pleasure. To be the champion has to be the consequence of it. And as Palmeiras being the Champion of 20th Century, title given by “Folha de São Paulo” Journal, a serious news vehicle, it’s proven , not only pragmatical soccering, but with beautiful soccer playing we can be champions too. Sorry for my poor English, and I apologise for writing something probably you already know, but I just wanted to express a bit of the brazilian Palmeiras fan spirit. Because it does all the difference between the other Brazilian team fans. Its wonderful! A British Palmeirense! Hi Eishin! Thanks for your comments, it’s great to have readers all over the world, not least in Japan! Don’t worry about your English, it’s more than fine. And, again, thank you for your support! I hope you keep on visiting the blog and reading the articles. Abraço, all the best to you! Hey pal, your getting famous hahaha http://www.3vv.com.br a supporters site has recomended to all its readers to take a look here and give you a boost. So keep it up, it’s incredible how brazilian soccer teams aren’t known in most of the world. Fábio, thanks for you message! Yeah, you’re right: not much is written about Brazilian football, it’s a shame. We’ll, let’s change that little by little! Thanks for helping spreading the word. Volte sempre! Abraço! My bet on the S.A Cup next match: “Patético” Mineiro 0 x 2 Palmeiras. Rodrigo, valeu pela força! Abraço forte! I see a link to your blog at http://www.3vv.com.br and came to check. Its nice to see that our ”verdao” have some international fans helping spread this passion! Congratulations for your blog, its a nice reading. Stefano, thanks for your encouraging words! I’ll keep up the writing and you, please help spreading the word. Together, we make Palmeiras larger and larger for each day. Vamos lá Verdão! Agora que os mineiros do Chile já estão bem, vamos mandar os mineiros do Atlético pro buraco! Abraço, take care, come back often and check for news! It is just great to have a website informing us about Palmeiras. It’s a wonderful team, with a rich history, that has forgotten for some time of its own size….but I am sure that with Felipão and with the arena….our path of glory will return in the near future. Paulo, thanks for your message and your enthusiasm (which I share). AVANTI PALESTRA! Boa noite, eu não sei escrever em inglês (sou brasileiro e só sei português infelizmente), espero que consiga achar um meio de entender essa mensagem. Muito obrigado pela iniciativa de divulgar o nosso Palmeiras, é muito bom saber que existem verdadeiros palmeirenses fora do Brasil. Continue com esse blog que eu o acompanharei e tentarei lê-lo e tentatei fazer comentários em inglês. Estou no Brasil já 12 anos, entendo português e já escrevo razoavelmente. Obrigado pelos sues comentários e pela ajuda em divulgar o Anything Palmeiras. Juntos, foraleceremos o S.E.P cada vez mais! Abraço! i love the big green!!!!!!!!!! It´s very nice to know that our Palmeiras has been represented arroud the world!! I´ll be aways visiting your blog from now! Washington, that’s great news, keep on visiting! You guys from abroad are my main target, of course. Help spreading the word! Parabens pelo blog cara verdão sempre ate em ingles hauahauahua! Suprisingly Scolari sent Valdivia on the pitch. El Mago said he wanted to play and the coach didn’t refuse it. Who should it? After the lights came back, Palmeiras and U Sucre made an friendly match, with the “Verdao” clearly thinking about the derby match against Corinthians on Sunday. With the Avai’s win against Emelec, there are four Brazilians teams at the quater-finals which will be Avai x Goias and Palmeiras x Atletico-MG. To prevent two teams of same country to reach the finals, Conmebol create a rule that they can change the pairings so the winner of Avai and Goias game match up with the winner of Palmeiras and Atletico-MG at the semifinals. The other pairing will be between LDU x Newell’s Old Boys and Tolima and Independiente. Congratulations, Kristian, for your great website about Palmeiras! It’s amazing to see this blog! We need to increase the number of foreign supporters of Palmeiras!!! Brazilian people are addicted to football (soccer), and the Palmeiras is, for sure, the most beautiful team in Brazil!!! Let’s Rock Palmeiras!!! Tks!!!! Leandro, thanks for your enthusiastic comments! Keep on visiting and spreading the word! Cheers! Um grande abraço alviverde e muita sorte pra vc. Amazing website! 15 millions here in Brazil are very, very proud! Keep going with the good work! Everything for the Big Green. Palmeiras will be the Sulamericana’s champion. muito boa essa sua idéia de criar esse blog. ajuda a expandir cada vez mais o Palmeiras para o mundo. parabens pela iniciativa e continue sempre assim. o Palmeiras é um dos maiores times do mundo! Congradilations for your Palmeira´s blog! Now your blog is in the http://www.3vv.com.br site, and i am sure that a lot of Palmeira´s fans will visit it. As a sugestion for you, you cold also create a twitter for your blog. The #twitpigs would love it. Then you can share new posts of the blog faster. See you in the next post! Bye! Thanks for the feedback. The response so far has been overwhelming. And today, I’m having guests over, so I can’t give everyone the attention they deserve on the blog. But yes, I do interact with my readers and normally answer every coment made on the blog. Congratulations!!! the whole idea for this blog is awesome! Palmeiras my life is you!!! Hey, man! Great initiative! Spread Palmeiras all over the world! Awesome blog, going to my favorites, no doubt! Hi Victor, that is great, looking forward to seeing you a lot here on Anything Palmeiras! Abraço!